On a cold, snowy day like today, I need something better to focus on. I need to sit outside and enjoy a beautiful day for a swing set in williamsburg. I could swing lean back on the swing, with the sun on my face, and see my drink waiting on the deck table for when I wanted to take a break and just sit. 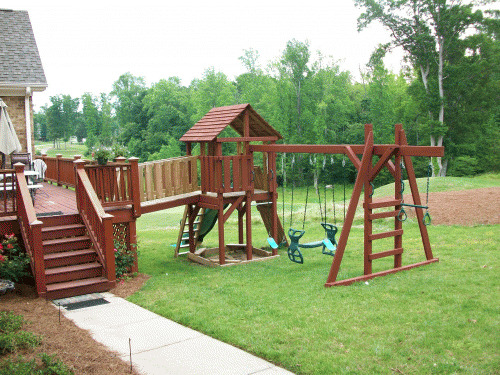 I love the way this play set attaches to the deck via that cute little bridge. Course, I'd probably put a gate on the deck-side, so Jack didn't dart across to the play set anytime we tried to just go into the yard. If you remember, we lucked out and get a freebie play set when we moved into this house, but it was already well-loved three years ago. We've talked about doing a little work on it, or the deck for that matter. I'd really like to get our horse swing (made from an old tire) hung up so Jack could swing on it while he's still small enough.